Please help me welcome my first #wingweek guest poster, Camilla from Culinary Adventures with Camilla. I'm pretty thrilled that I inspired her to make chicken wings in her own kitchen for the very first time! 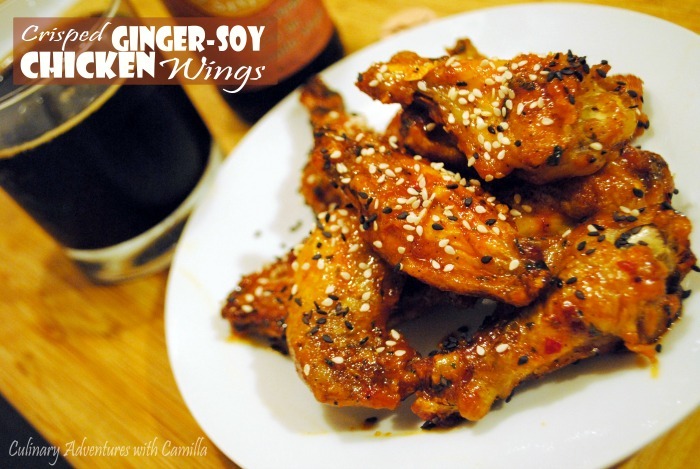 Her Crispy Ginger-Soy Wings sound like they are bursting with flavor, plus, she's offered up a beer pairing to go along with her wings. No wonder I like this girl. When Heather posted that she was looking for some chicken wing guest posts this month, I almost skipped reading the rest of the request. Chicken wings?!? I thought. I don't fry. I remember watching a cooking show about chicken wings and there seemed to be a complicated dance between the fryer and the oven. And, remember: I don't fry. 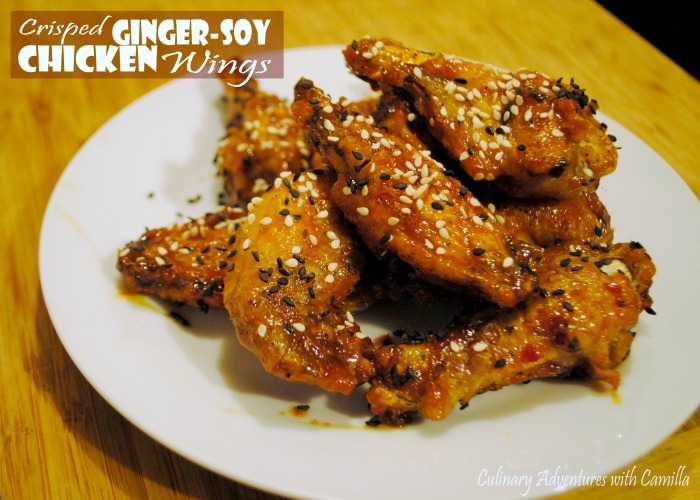 But as I finished reading her post, I decided that this would be a good culinary challenge, one that I definitely wanted to complete: make tasty, crispy wings without frying. Challenge accepted. Good chicken wings are about great flavor and great texture. I did it! This has both. "Mom, I can't stop eating these," said the littlest Kitchen Elf. Now that is saying something because of the four of us, he has the most vegetarian sensibilities and will often skip the meat on his plate. So, be forewarned, these might be addictive; I made them three times in a week. Yes, that might seem excessive, but they are really, really good. Make crispy wings without frying! These wings are bathed in a sauce so flavorful, you won't be able to put them down. Preheat the oven to 450° F. Line baking sheet with parchment paper. In a large mixing bowl, toss the wings with oil and season with salt and pepper. Place wings - skin side up - on the prepared baking sheet. Roast them for 45 to 50 minutes. They will be cooked through and the skin nicely browned and crisped. While the wings roast,whisk all of the remaining ingredients except the garnishes together to create a hot sauce. When the wings are done, add them to the sauce. and toss to coat. Garnish with the sesame seeds. Serve hot. Nothing goes better with wings than beer. Really. I think those two were made for each other. I like a malty brown ale to temper the heat of the wings. 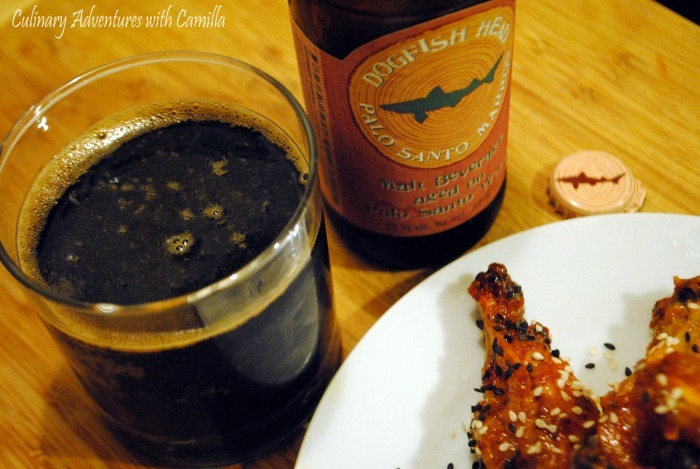 For this batch I poured Dogfish Head's Palo Santo Marron. This brown ale rings in at 12 percent ABV and it'll run you about $16 for a 4-pack. It's not cheap. But, if you can find it, it's worth it! This beer is named for the 10,000 gallon vessel made from hard, oily Palo Santo wood from Paraguay in which it's aged. Though called a 'brown' it's more black than brown and has virtually no carbonation or head. You smell cocoa and coffee up-front and it's thick. Like smoothie-thick. It's a sipping, not guzzling beer, so savor the wings and the beer...one bite and one sip at a time. If you can't find Palo Santo Marron, Lost Coast's Downtown Brown, Sam Smith's Nut Brown Ale, and Anchor Brewing's Breckle's Brown are solid substitutes. Cheers! And thanks, Heather, for having me as a guest poster. It's been fun. Oh man, I love dark, thick beers. What I wouldn't give for a plate of these wings and pint of Palo Santo Marron! Thanks so much for sharing these with us today, Cam! To find more of Camilla's Culinary Adventures, drop by and visit her blog Culinary Adventures with Camilla. You can also connect with her on Facebook, Pinterest, Twitter, and Google+!